About 85% of men will have major hair thinning by the time they're 50. Some guys start to lose theirs before they turn 21. Human hair grows in a continuous cyclic pattern of growth and rest known as the "hair growth cycle." Three phases of the cycle exist: Anagen= growth phase; Catagen= degradation phase; Telogen= resting phase. Every day we lose around 50-100 strands of hair approximately, but then the same is replaced by new ones.This is called normal hairloss and does not need any treatment. A lot of factors trigger hair loss, such as unhealthy lifestyle, stress, pollution, improper diet. Androgens (male hormones-testosterone, dihydrotestosterone) are the most important control factors of human hair growth , both in men and women. Androgens are responsible for the development of male and female pattern hair loss. 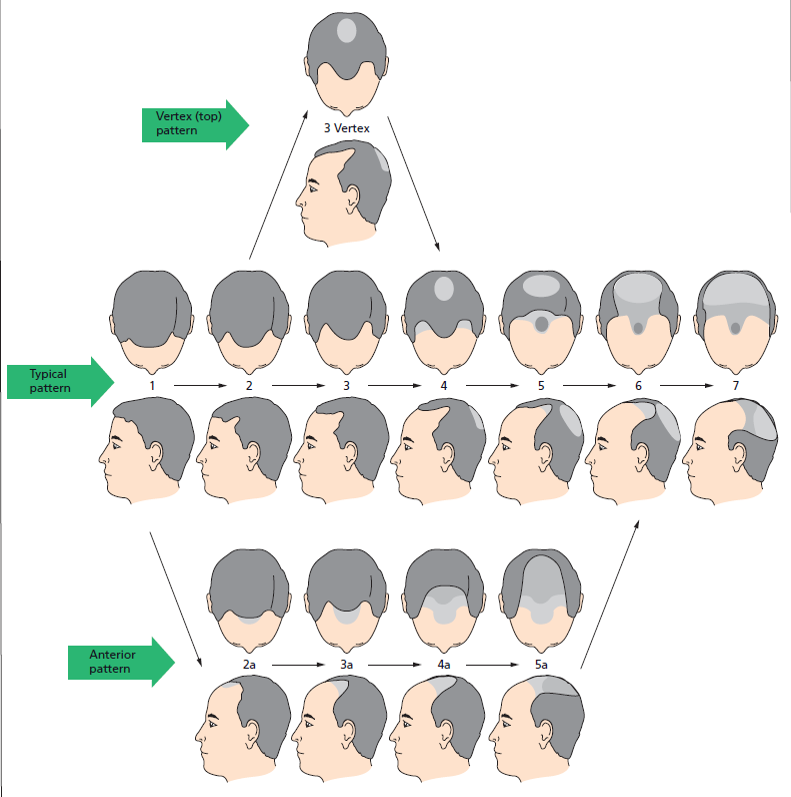 Male pattern hair loss (also known as male androgenetic alopecia, male balding) is an androgen-dependent, genetically determined trait. There will be gradual thinning in the temporal areas, producing a reshaping of the anterior part of the hairline. In male pattern baldness, hair on the side and back of the head do not fall out. This is because the hair in this region is not affected by the male hormone – DHT or Dihydrotestosterone. Diffuse Hair loss also known as Telogen Effluvium. Telogen effluvium occurs when external factors disrupt natural hair growth cycle. During extremely stressful situations, the body can trigger a disproportionately large number of hairs to move into the telogen phase all at once. About 3 months later, this hair begins to fall out as it would normally during this point in the telogen phase, but in significantly larger amounts than usual, causing diffuse thinning over the entire scalp. The hair loss from telogen effluvium is usually temporary. The hair follicles are not permanently or irreversibly damaged. What is the approach to Manage Hair Loss in Men? Evaluation of patient's hair problem by examining the scalp and hair and investigations like Trichoscopy and other blood investigations if necessary. It's important to find the cause and whether or not the problem will respond to medical treatment . Treatment Option must be customised according to the root cause.